There are many reasons why the Fuchs rim became a legend. The most important is the design. The critical impetus was provided by Ferdinand Alexander Porsche. In 1966 the aluminum wheel made its world debut. As did the 911 S.
The first 911 sports model to feature the “S” suffix was distinguished by its exclusive aluminum wheels. The 911 S was, after all, the first model to sport the now legendary Fuchs rims. At the time, Porsche spoke merely of an alloy wheel that was part of the sports car’s standard equipment. The idea behind the aluminum wheel was as simple as its description was plain: the new S model was to have lighter rims than the series 911, which would reduce the unsprung masses. Less weight means a more responsive suspension–a sporty plus for the S model. The difference was supposed to be some 3 kilos less per wheel compared to the steel version–the goal stated in the specifications for the 911 S.
In 1965, that appeared to be an impossible task for conventionally manufactured cast aluminum wheels; the lighter variant could not withstand the loads. It took an innovative idea from rim-master Otto Fuchs to resolve the conflict between lower weight and greater durability. Fuchs produced a wheel that was light, yet still equal to all of the challenges it would face. For its part, the company employed a new production method: the wheel was manufactured from one piece. The blank was forged, and the entire rim area from outer to inner flanges was rolled out. The original Fuchs rim had the typical five-spoke design from the outset, although the spokes were still tapered toward the ends. This original shape was presented to Porsche in May 1965. The minutes from the meeting record the following: “In contrast to our proposal, Mr. Porsche Jr. changed the shape of the five connecting pieces between the hub and the rim for reasons of style and appearance. While our design was well-adapted to the shape of the series vehicles now being retired, the shape developed by Mr. Porsche Jr. appears more harmonious with the new vehicle.” Thus did 911 designer F. A. Porsche invent the cloverleaf design that has characterized the Fuchs rim ever since. Porsche Centers worldwide still sell nearly all versions of the Fuchs rim. The wheel designed by F. A. Porsche is part of the Porsche Classic product range. 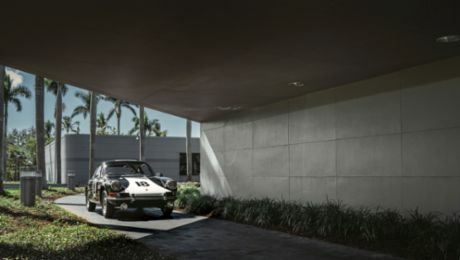 This Porsche 911 first touched American soil in Florida, where it’s now on display in a museum. Ferdinand Porsche was born in the North Bohemian town of Maffersdorf.